Very few home cleaning jobs call for an industrial-grade pressure washer. The market for pressure-washers has exploded in recent years, and with it the variety of different types available. These tools all work by using compressed air to shoot a high-speed spray of water from an adjustable nozzle, but that's where the similarity ends. You can spend as little as $50 to $75 for a lightweight electric model, or as much as $500 for a gasoline-powered goliath, and the right model depend entirely on what you will use it for. 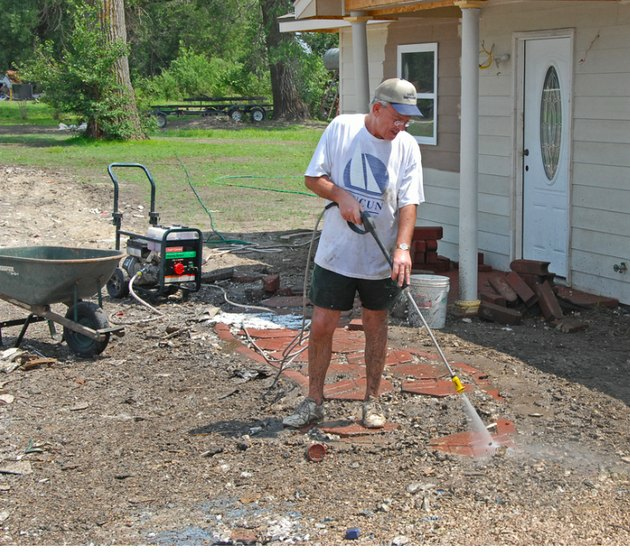 Some people need a pressure washer primarily for washing the car and doing spring cleaning on the deck , while others need one for tough jobs, such as cleaning concrete walls. If you use a heavy-duty machine to wash your car, you could blow off the tires, so there's really no reason to have a one around the house if you don't need it. In fact, most homeowners can easily make do with a consumer-grade model, or, if cleaning driveways is part of the program, a semi-professional one. Besides being less destructive, smaller machines are easier to store and to use, and they don't cost as much. You have a choice of a wide range of electric and gasoline-powered machines from a variety of manufacturers. Electric machines are all corded: cordless technology hasn't found its way into the world of pressure washers for two reasons. One is that pressure washers need more energy than a battery can provide, at least for any useful length of time. The other is that a pressure washer always has to be connected to a hose, so having a cord in the way isn't much extra bother. Semi-pro pressure washers can deliver up to 16,000 cleaning units, which is plenty for most household chores. When shopping for a power washer, your first question might be: "How much pressure does this machine develop." That's definitely important to know, but you should follow up that question with two more: "How many gallons per minute does it spray?" and "How many cleaning units can it deliver?" The last question is the most important. Cleaning units (CU) are a product of the pressure in pounds per square inch (PSI) and the flow rate in gallons per minute (GPM). For the mathematically minded, this can be written as an equation: CU = PSI x GPM. A unit that develops 3,000 psi may not clean as well as one that develops 2,400 psi, if their flow rates are significantly different. High pressure is destructive—it can damage siding and wear gouges in wood decks. So when choosing between machines that deliver the same number of cleaning units, it's best to go with the one that has the lowest pressure rating and the highest flow rating, if you need it for general cleaning purposes. You should find this information on the product label or in the manufacturer's brochures. Choose a high-pressure model only if you need the extra pressure for a specific purpose, such as stripping paint or restoring concrete. If your main interest is washing your car and your outdoor furniture, you probably don't need more pressure than 2,100 PSI or a flow rate greater than 2.1 GPM, which amounts to about 4,400 CU. For cleaning your deck, patio, and siding, the numbers should be higher—more like 2,600 PSI, 2.5 GPM, and 6,500 CU. Electric pressure washers can handle surprisingly tough tasks. Gasoline-powered pressure washers were the standard until manufacturers began offering corded models that could do most of the same jobs. Electric pressure washers are generally lighter and easier to move around than their gas-powered counterparts. Startup is also easier. You don't have to fill a gas tank and pull a starting cord—just plug it in. You'll never have to contend with a flooded or dirty carburetor. Gas-powered machines have the power advantage when it comes to large cleaning jobs, but for most household chores, this advantage isn't important. 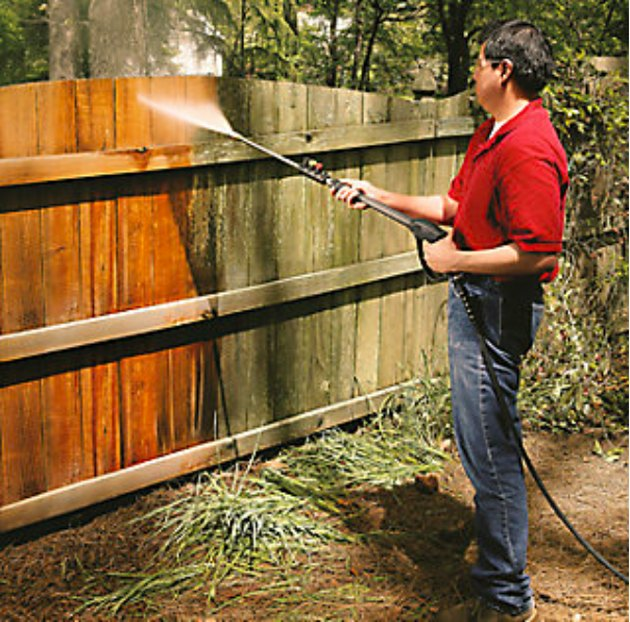 A properly-sized electric power washer will clean your deck as quickly as a comparable gas-powered one. Unless your job brings you too far from a power outlet for a cord to reach, an electric power washer is the better practical and economical choice. You can even store it indoors instead of in the garage with the lawn mower and snow blower. The color of a nozzle indicates its spray width. Every pressure washer comes with a selection of nozzles, or tips. They are color-coded to distinguish the width of their spray pattern. The narrower the pattern, the more pressure the tip delivers. The red tip is the narrowest (0 degrees) and can do the most damage, so it isn't always included. Don't worry—you probably don't need it. The yellow tip (15 degrees) and the green one (25 degrees) are the ones most people use for cleaning, and the white (40 degrees) and black (or blue) one (60 degrees) are for spraying and soaping. Most models come with at least a green, yellow and black (or blue) tip—higher-end models (particularly gas-powered) come with all five. In addition, some packages include a turbo tip, which uses rotating action to clean as well as (or better than) a yellow tip. Primarily featured on electric pressure washers, the soap reservoir allows you to spray a mixture of soap and water, using a black, blue or white tip. Using this feature, you can pre-soap your deck or car prior to washing it. A wand is supplied with every pressure washer, but you can also add a telescoping wand that allows you to work in high places with minimal ladder use. In addition, you can buy a surface cleaner—a disk-like attachment that fits on the end of the wand in place of a nozzle. It distributes water over a wider area at a sufficient pressure for light cleaning.